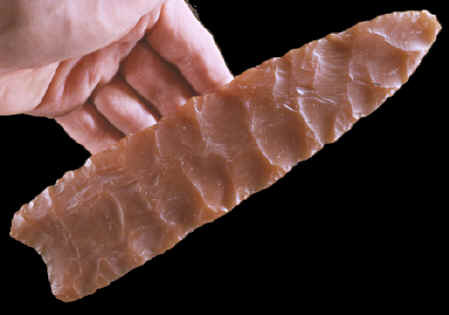 This large Clovis point was found along with 55 other Clovis artifacts in the Fenn cache and it is the longest point found in the cache. This point is described as unfinished, as a late stage Clovis preform, but in its present form it may have served as a knife. It was skillfully made using percussion flaking. This point was made from a beautiful piece of translucent red and purple Utah Agate. It measures 8 1/4 inches (21 cm) long. 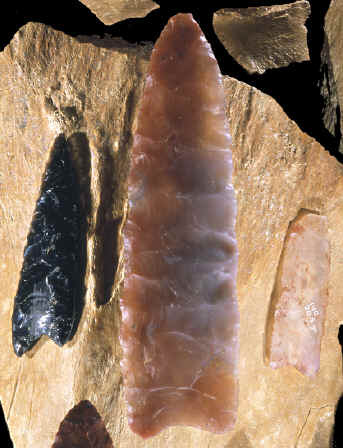 This picture shows three of the Clovis points from the Fenn cache. They are laying on top of a large piece of mammoth bone from the Lange-Ferguson Mammoth kill site in South Dakota. The large point in the center is the one offered as a cast. 1999, Bradley, Bruce and Frison, George, "The Fenn Cache, Clovis Weapons & Tools", pp. 16-17.